I may have forgotten to send those veterans groups a million dollars as I promised, but at least I haven’t forgotten this week’s ScuttleButton puzzle. Fritz is the Pitz — 1984 deriding Democratic presidential candidate Walter Mondale. Time for a Change/Berg for Congress Republican — Lost to Rep. Bruce Vento (D) in 1978.
pen that reads “Insight with Beth Ruyak” — I’m on this program every Monday at 9:06am Pacific/12:06pm Eastern. 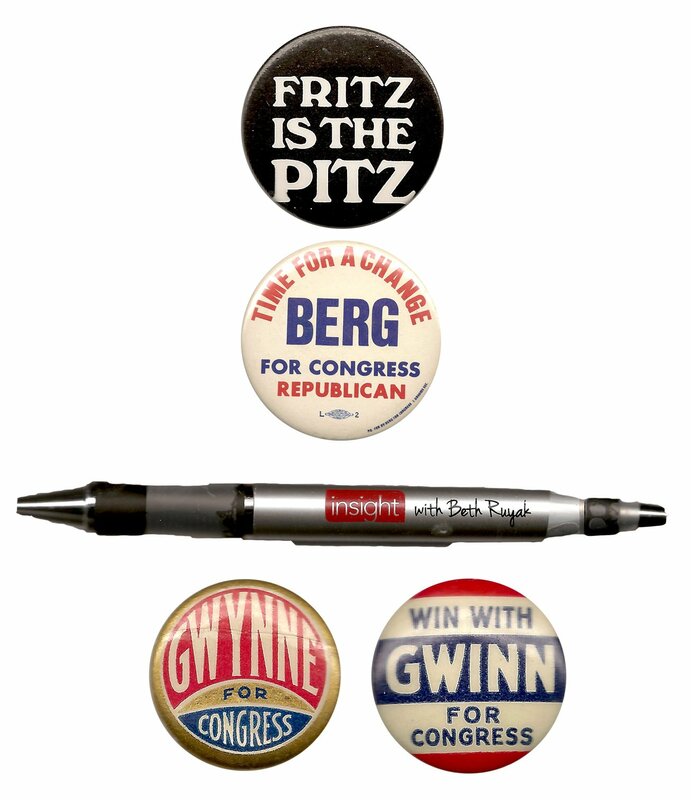 two Congress buttons, Gwynne and Gwinn — The first button is for John Gwynne (R-Iowa), who served from 1937-48; the second is Ralph Gwinn (R-N.Y.), who served from 1941-58). Pittsburgh Penguins. Hockey’s Stanley Cup winners for 2016. And the randomly-selected winner is … Luke Martin of Olathe, Kansas. Luke wins the coveted Political Junkie button.